I spent more time in Charleston than under the Atlantic Ocean, so this observation is more than a limited periscope view. This historic town is well preserved, classic as Gone With the Wind. Fort Sumter faces the Battery Park, but in the heart is the Market Place, where the only surviving building is about human exchange. Now a museum, it is the slave auction gallery where the black slaves were auctioned fresh from the port more than hundred years ago. It is estimated that over a third of African slaves came through the port of Charleston. The main street is King Street, where the City Library provided good reading; mostly the sports pages about Roman Gabriel. The street parallels Meeting street and both run to North, toward the Charleston Navy Shipyard. I drove down it many times, crossing the railroad track, near Calhoun Street where the racist Dylann Rowe shot the church goers. The rail crosses King and Meeting street. The great divide, the proverbial saying “born in the wrong side of the tracks.” North of the line was the dodgy slum were the black community lived. Farther north, the Navy Liberty town, Reynold street, drunk sailors would strolled every night from bars and taverns catering to the Navy Main gate. I was there when racial segregation manifested into the anti-miscegenation laws. Filipino sailors could not marry whites, or even shack up with one. Live together in a trailer and you will get a visit from the vice squad. I found it interesting that some Filipinos would go to North Carolina to marry their white girls, since they had different anti-miscegenation law for Filipinos after WWII. It might be the loophole that the father of Roman Gabriel found. He married an Irish girl and settled in Wilmington, NC where Roman grew up and became All-American. Charleston is city of Rivers, it fuels the economy around it. Southern politics learned after reconstruction to send the same representative to bring home porky bacon. Mindel Rivers became one of the most powerful men in Washington. He was re-elected multiple times, eventually gaining the chairman of the Armed Forces appropriation. Nuclear submarine flotilla turned the city into a military-industrial complex. The Southern Democrat Party that once controlled the house now had their fortunes reversed. Mindel Rivers had the makings of the perpetual drunken sailor, friend of the military, but an ardent segregationist of his time. This is more than interesting trivia to me. The unleashed dog awakens the sleeping Filipino nation. barking and brewing the historical revolution in the cradle. Hilarion Martinez’s narration was published in the Sunday Times Magazine on December 25, 1949 when he was already 72 years old. What exactly immediately happened with the body of Rizal that day reminded me of José Martí (1853-1895), the Cuban patriot. Just one year earlier,May 19, 1896, he was killed in the battle against Spanish troops at the Battle of Dos Ríos, The Spanish took possession of the body, buried it close by, then exhumed the body upon realization of its omen. They are said not to have burned him because they were scared that the ashes would get into their throats and asphyxiate them. He is buried in Cementerio Santa Efigenia in Santiago de Cuba. Many have argued that Maceo and others had always spurned Martí for never participating in combat, which may have compelled Martí to that ill-fated suicidal two-man charge. Some of his Versos sencillos bore premonition: “No me entierren en lo oscuro/ A morir como un traidor/ Yo soy bueno y como bueno/ Moriré de cara al sol.” (“Do not bury me in darkness / to die like a traitor / I am good, and as a good man / I will die facing the sun.”) Maybe the two Masons compared notes on May 1888 when the two were in Manhattan. “It was six o’clock in the morning of December 30, 1896, when we woke up at our quarters at the corner of Sta. Potenciana and Magallanes Streets, in Intramuros, to attend the execution of Jose Rizal, about which we had already been briefed the day before. We were theLeales Voluntarios de Manila, a semi-military organization under the command of Capt. Manuel Leaño. Our immediate officer was a youthful Spanish lieutenant named Juan Pereira. I was twenty years old then, and a member of the drum corps. We marched out of Intramuros through the Puerta Real, or where Nozaleda (now General Luna) Street out through the walls on the south, clad in our camamo uniforms and with our cajas vivas(or drums) strapped around our waists. We proceeded to what is now Padre Burgos Street, under an overcast sky and in a chilling December morn. As we rounded the corner of P. Burgos and General Luna Streets, we got a glimpse of thecuadro, a square formation of about ten companies of Filipino and Spanish soldiers. The former occupied the inner portion of the quadrangle, while the latter were at the rear. This formation was strategic because the Filipino soldiers’ position with-in the cuadros ignified that the Spanish authorities wanted Rizal to die in the hands of the Filipino soldiers. If the latter disobeyed the command to fire upon Rizal, the Spanish soldiers positioned at the rear would fire upon them. There were civilian spectators, too. The side of the cuadronear the bay was open. As we approached the quadrangle, we saw some Spanish military officers earnestly talking in low voices. Rizal was not yet anywhere to be seen. Not having had a glimpse of the man before, I began to wonder what he looked like. I remembered what my mother had told me about Rizal: that he was so learned that he could not be poisoned by anybody because he always carried with him his own spoon and fork, by means whereof he could detect whether his food was poisoned or not; that many other legends had started to be woven around him; and that he was fighting for the cause of his country and countrymen. Soon the small crowd heard the muffle sound of our approaching vivas(or drums) draped with black cloth during execution ceremonies. A slight commotion broke out at the right end of the cuadronear the bay as some soldiers with fixed bayonets entered, followed by a man in black suit, his elbows tied from the back, on his head achistera(or black derby hat), on one side a Spanish officer and on the other a Jesuit priest. When I saw the man, I knew he was Rizal. A group of Spanish officers who were standing nearby opened into amedia luna(i.e., a semicircular formation). Then a Spaniard (we would learn later he was Lt. Luis Andrade, one of Rizal’s popular Spanish defenders and sympathizers) affectionately shook the latter’s hand. 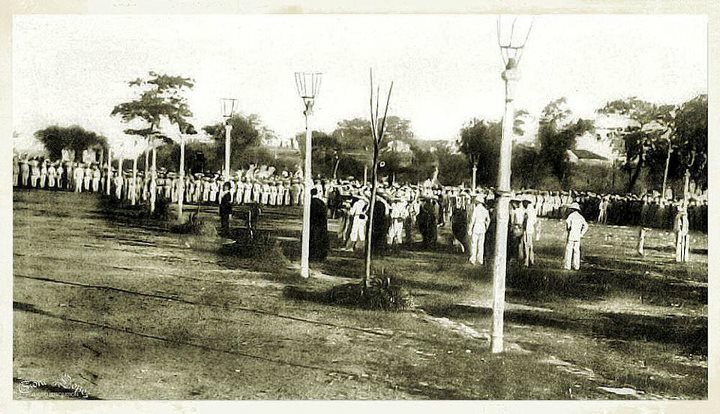 When Rizal was near the center of the quadrangle, themayor de la plaza, a colonel, announced at the bandillo:‘En el nombre del Rey, el que se levante la voz a favor del reo sera ejecutado’(In the name of the King, he who raises his voice in fovor of the criminal will be executed). A deep silence enshrouded the whole assembly. The commanding officer accosted us and gave us this injunction: ‘Should Rizal attempt to speak aloud, beat your drums so hard as to drown his voice’. I looked at Rizal. He was regularly built, unshaven, and quite pale, perhaps as a result of his detention. But he was visibly composed and serene. A Jesuit priest approached him, prayed, and blessed him. Then a colonel approached Rizal likewise, as the commanding officer ordered us to move two paces backwards. The firing squad, composed of six Filipinos, came forward and took our former position behind Rizal. My heart beat fast, and as in all other executions I had witnessed before, I felt tense and nervous. Amid the silence, I saw Rizal move his head very slowly up and down, his lips moving as if he was praying. Then the commanding officer raised his saber – a signal for the firing squad to aim. Then he dropped his saber to a fuego position. The simultaneous crack of rifle-fire shattered the stillness of the morning. Jose Rizal exerted one last effort to face his executioners and toppled down with a thud, his face towards the sky and his derby hat thrown ahead. He fell dead at his feet in the direction of the bay. Many of the reos or offenders had been caused to kneel and be hoodwinked before they were shot on the head. But Rizal was spared that humiliation. Then the capitan militar de la sanidad (i.e., medical officer) stepped forward, knelt before the fallen man, and felt his pulse. Looking up, he beckoned to a member of the firing squad to come forward and give the final tiro de gracia (i.e., another close-range shot to the heart), probably to ensure that Rizal could not come up with the miracle of life anymore. I thought I saw a faint haze from Rizal’s coat, but it might have been a wisp of morning mist. Seeing the body of the fallen Rizal in front of me, I felt very weak. The officers began to show animation again. They fell in formation and marched to the tune of the Spanish national air, the paso doble Marcha de Cadiz. Hilarion Martinez was, indeed, lucky to have lived in historic times. He subsequently joined the Philippine Revolution. During the Filipino-American War, he was a member of the “Batallon de Manila” under General Pantaleon Garcia and Col. Rosendo Simon. He distinguished himself in several engagements, so that he was promoted later to the rank of 2nd Lieutenant. In an assault on the American cavalry stationed in the church of Tondo, he was captured and imprisoned for about eight months in Intramuros and later in Cavite, where he was released shortly after the cessation of hostilities. Navy Liberty in the French Riviera is among the best I have experienced. I remember going there when Cannes was still unknown, nor the place called Villefrance, after DeGaulle pulled out of NATO because of France’s love and hate against the United States. One summertime, I looked up the periscope from Gulf Juan, scanning the beach and my usual taking Liberty with our hero and the French Connection and the love songs of Whitney Houston. Elevating the Periscope I can see the train running on the mountain side and rewinding back my memory, many summers ago. “We shall hardly see each other again,” Rizal said when they parted. “Really? I believe it, “she said, and waved to him as the train pulled out. Rizal was never lost in the words of Shakespeare, but he was merely smitten in brief passing fascination. He was on his way home to the Philippines to his childhood sweet heart, Leonor Rivera the real life Maria Clara of his novel but more of Shakespeare ‘s Romeo and Juliet tragedy . She prevented Rizal from falling in love with strangers in his travels. Rizal was coming home to reclaim the love of his life. Unfortunately, the affair was doomed in the very beginning. He was boarding in his uncle’s house in Intramuros just starting college, when he met just the 11 years old Eleonor. She was a “pretty woman with a high forehead, soft and wavy hair, almond eyes, small and pensive mouth, and engaging dimples. She was described as a talented, mature, and intelligent lady. She played harp and piano and had a charming voice. She could write and read Spanish. The puppy love blossomed into secret love letters written in different languages including English. Hidden communications because Leonor’s mother was against Leonor pen pal lover. Friendly spies of Rizal informed of her activities from Camiling to Dagupan. They were also distant cousins. A year later, Rizal, the fugitive his country, was on his way to America. The American lady in Marseilles closer, but just distant memories on his long railroad travel from San Francisco to New York. Leonor immortalized in Noli Me Tangere made Rizal the subversive in the eyes of Spanish authority. The mother fearing safety succeeded in convincing her daughter to forget the young Bohemian rebel. Some wrote that the mother even persuaded Eleonor that Rizal was only interested in Dr Blumentritt daughter. Leonor was forced to marry Henry Kipping, an English engineer working on the Manila railroad to Dagupan. She agreed and she would never sing again for her mother. The engagement broke Rizal heart on the chugging sound of locomotion, the pair of a long iron tracks always abreast, reaching final station would never touch. The greatest love was on the wrong track, Noli Me Tangere always on an arm’s length. A year later, Rizal, the fugitive his country, was on his way to America in 1888. The American lady in Marseilles just distant memories on his long railroad travel from San Francisco to New York. He saw the beautiful statue in the harbor, the gifted Lady Liberty from France. The lady became the symbol of freedom and liberty. Rizal boarded across the Madison Square Park. He has a view of the famous MSG before it moved uptown at 34th Street. The lover was not only genius but possessed legendary physical prowess. The Statue of Liberty in the Hudson River greeted our Navy ship to New York City fifty years ago. My eyes eagerly scanned the New York skyline as I was waiting for the Liberty Call announcement. The panoramic view from the water was incredible, I would swap it to a view of the water as I stepped ashore, Liberty Call, Liberty Call…..
Manhattan Island is a liberty paradise for any sailor. In just few hours, I would be staring at the bottom of my beer glass, feeling refreshed, a common experience for sailors after few days at sea. A few more glasses were enough to rewind my memory back to another time in the same zone. “Bottoms up” easily put me in the mode for taking more liberty of my past life. Over a century ago in the spring of 1888, Lady Liberty first stood on the harbor, joining the Brooklyn Bridge as an icon of New York. I met Dr Jose Rizal on my liberty tour in Mid-Manhattan. Other icons I encountered include the first equestrian George Washington monument historic in Union Square in 1856 and another statue located in Greenwich Village. These were part of the landscape near Madison Square Park where Rizal lived. I was surprised to hear his admiration to the revolutionary George Washington rather than Jefferson. Rizal would distance himself from violent revolutions. Rizal has many gifts however; he supplemented his numerous writings with almost instamatic sketches of the places he visited. At the time, the Brooklyn Bridge was completed in 1883 and became the longest suspension bridge in the world. The architecture remains a marvelous sight in East cityscape. Charles Adams Platt, a prominent NY etcher, painted the Bridge in 1888, but I have been looking for the copy of the rough sketches by Jose Rizal. It took me years, and I finally found a copy of his sketch. I sober up as I saw the Gothic twin towers and steel suspension cable. I drove over this bridge many times as I lived in Brooklyn later in my life. It is the same as it was when Rizal left in New York onboard the City of Rome, the Titanic ocean steamer of the 1880s. He has many gifts, and I was fortunate to have his company on my Cinderella Liberty excursion in the Big Apple. There will be more port of calls, let me share it with you. On an island on the entrance of the New York Harbor stood the copper colossus that celebrated its 125th anniversary last Friday, October 28th. The towering Lady Liberty is the symbol of America, she is score and five years younger than Dr Jose Rizal. An estimated 3.5 million people visit Liberty Island every year. On average, 204 people climb to the crown of the mother of exiles every day. On this 150th Rizal anniversary, he wrote his date with the famous lady. We left New York on 16 May 1888, Wednesday, at 9:30 in the morning. The crowd waved white handkerchiefs, mingling with the numerous red ribbons of the hats and neckties. Some were crying. We saw the Brooklyn Bridge. The Statue of Liberty rises majestically on the island. It produces a most beautiful effect. Many passengers came on board. Few days earlier, Saturday, May 12.On board train from Chicago he wrote, We shall arrive at the English territory in the afternoon, and we shall soon see Niagara Falls. We stop for some time to see the points that are beautiful; we went at the side below the Falls; I was between two rocks and this is the greatest cascade I ever saw. It is not, so beautiful nor so fine as the fall at Los Banos; but much bigger, more imposing and could not be compared with it. The cascade has various falls, various parts. We left the place at night. There is a mysterious sound and persistent echo. Sunday, May 13. We wake up near Albany. This is a big city. The Hudson River which runs along carries many boats. We crossed over a bridge. The landscape is beautiful; and it is not inferior to the best in Europe. We are going along the banks of the Hudson. They are very beautiful, although a little more solitary than those of the Pasig. There were ships, boats, trees, hills; and the major part is cultivated. The Hudson is wide. Beautiful ships Sliced granite rocks were paved along the railroads. Some points widely extended. There were beautiful houses between trees. Day fine. Our grand transcontinental trip ended on Sunday, May 13, at 11:10 A. M. We passed through various arches in tunnels.– the Art Age, 75 W. 23 Street. Originally, the statue was supposed to be an Egyptian peasant girl that would have stood at the entrance of Egypt’s then-new Suez Canal, historians say, but plans would later evolve into the Roman goddess that would instead adorn New York harbor. Had the original plan happened, Rizal would have seen this peasant girl in Egypt. He passed the Suez Canal five times in his lifetime, his last journey on October 1896 when he was recalled to Manila for his final martyrdom. He even sketched Suez Canal but I am looking for the other famous New York icon that he saw in New York. He penciled the oldest suspension bridge, the Brooklyn Bridge connected the island of Manhattan to Long Island in 1883. Webcam has just been installed, Lady Liberty is going high tech on his 125th birthday. You can now get virtual panoramic view of the island online but this is what 27 years old- Dr Jose Rizal witnessed in the Spring 1888. The Lady was just on her second year in America. Remembering the Filipino American victims of September 11 is by telling their stories, from the words of a humble cleaning lady to the to the professionals writers. They all have that common denominator- the World Trade Center and equating in parallel, the same tragic time of their lives on that day. It is also the unique experience of Filipino American, mostly recent immigrants whom I am certain we can share and certainly connect. The Outstanding Filipino Americans (TOFA) in New York Committee. My good friend, Maria Embry provided the biographies below from her compilations. Hector Tamayo’s is just of the typical Pinoy, but he is the closest one that I have encountered among all the victims. My longtime friend, Alton Famarin remembered Hector as the President of the Aklan Association. He told me that Hector return to the floor at the World Trade Center, because he left the Engineering Report that he just prepared. At home in Queens, he had a karaoke machine with thousands of songs. “He had a lot of friends, most of them are relatives, and on Friday nights and Saturday nights and sometimes weeknights they would drink together and sing together,” said his sister-in-law, Sylvia Mercene. Many of those relatives lived with Mr. Tamayo at some point, because he opened his house to family and friends when they came to the United States from Aklan province in the Philippines, as he had in 1980. “As a joke we call his house the Ellis Island,” Ms. Mercene said. How typical can he be? I have the privilege sharing the Ellis Island Filipino connection with Maria and just can’t help noting the metaphor of his house and Ellis Island. This is draft and I will welcome anything that you might want to share and I will incorporate it. Grace Alegre and Ildefons Cua found romance at the south tower. Fresh out of graduate school from the University of Massachusetts, Ms. Alegre applied for a job as an accountant at Metropolitan Bank and Trust on the 17th floor, where Mr. Cua was the accounting manager, in 1986. “She didn’t get the job, but she found a husband,” Mr. Cua said. They married shortly after the interview and she became Mrs. Alegre-Cua. They have two children, Nicole, 13, and Patrick, 9. Mrs. Alegre-Cua did not have any trouble finding employment elsewhere. Two weeks after the interview, she was hired at Chuo Mitsui Trust & Banking Company, where she worked for 14 years, most recently at 2 World Trade Center. The only reason she did not get the job at Metropolitan was that the position had just been filled recently and Mr. Cua had conducted the interview as a favor to the general manager, he said. Cesar Alviar used to tell his wife, Grace, that everyone is born with a fate, and “your fate was to marry me.” He saw her dancing, long hair swaying, at a party in their native Philippines and asked where she lived. He was quiet and modest, she said, but very handsome. It took him three years to win her heart. But he stayed romantic. After 28 years, he still brought her flowers and opened doors for her. He loved to take her ballroom dancing. Three years ago, they renewed their vows. Mrs. Alviar wore an embroidered Filipino wedding dress. Their friends teased them “You still answered `yes,’ in spite of everything?” Mr. Alviar pointed out that they had been married three times, in a civil ceremony, the religious service, and then this one. Rameses Bautista said the cleaning crew at Marsh & McLennan loved his wife, Marlyn. She was the kind of worker who kept her cubicle and everything around it so neat “that they didn’t have anything to do,” he said. At the house in Boonton, N.J., that Cecile M. Caguicla shared with her friend Maria Luciano, there are flowers everywhere — dried hydrangeas and other delicate varieties, suspended in time. Miss Caguicla knew how to preserve them so their beauty would never fade. Miss Caguicla, who was 55 and had emigrated from the Philippines in 1975, was a vice president in the corporate accounting department at Marsh & McLennan. Her friend is planting a garden in her memory, with hydrangeas and sunflowers and geraniums &emdash; some of the flowers she liked best. There will also be evergreens, to last forever. Jayceryll deChavez never came across like a know-it-all. He was smart but soft-spoken. Still, he had his ambitions. For the longest time, he had dreamed of working in one of the twin towers of the World Trade Center. He even told his mother that he wanted to build his own tower. Mr. deChavez got part of his wish. He worked as an assistant to the portfolio manager at Fiduciary Trust, a job that his parents said he loved, in Tower 2. He was 24 and had just passed the first level of a test to become a financial analyst. He was eager to take a review class for the next level next month. He lived in Carteret, N.J., with his parents, Bibiano and Asuncion deChavez. Despite his humble manner, his parents said, Mr. deChavez never had to struggle to ace tests. He had been at the top of his class from elementary school through Rutgers, where he studied finance and economics. “He was a very ambitious guy,” his father said. Benilda Domingo was heading home to Laoag City in the Philippines from Manila after two years of menial work in Singapore. Relatives introduced her to the bus driver, Cefar Gabriel. While she had been working abroad, one of her brothers had married one of Mr. Gabriel’s sisters. By the end of the nine-hour bus trip, they were in love. The couple had three children &emdash; Daryl, 11, Yvonne, 5, and Lucki Angel, 2. But for 14 years they kept postponing their wedding, said Dorothy Gabriel, Ms. Domingo’s sister- in-law, because Ms. Domingo’s parents, living in Hawaii with their eldest son, were petitioning United States authorities to allow Ms. Domingo to immigrate, and a spouse would have slowed the process. Last year Ms. Domingo’s visa finally came through, and she brought the three children to America. She planned to return to Laoag City to marry Mr. Gabriel and to bring him over, too. She left the two younger children with her parents in Hawaii, and took the oldest with her to New York. Ms. Domingo, 37, found work with an office-cleaning company. “She was so proud that she was hired at the W.T.C.,” her sister- in-law recalled by telephone from Canada. Judy H. Fernandez was not supposed to be at her office in the World Trade Center on Sept. 11. She was scheduled to leave for a business trip later that day, and could have taken the morning off. But she went in to take care of a few things. For Ms. Fernandez, 27, being conscientious was a way of life. She worked as a benefits specialist in the human resources department at Cantor Fitzgerald, and made a habit of using her skills to help friends with their careers, even landing her cousin Maria Santillan a job at eSpeed. She was so organized that she made lists of all her goals and preferences: everything from her favorite flower to her desire to marry her boyfriend, Jon Plamenco. “She knew what she wanted in life, and she was going to do what she had to do to get it,” said her sister, Emma. “She wanted to be on the go all the time,” said her mother, Corazon. “She loved anything exciting.” Years after her brother, Rich, taught her how to ski, Ms. Fernandez took up snowboarding and taught everyone she knew. She had a large and tight-knit group of friends, and her organizational skills would often be put to use planning parties and ski trips. Ms. Fernandez and her friends had a tradition: a monthly girls’ night. There was a girls’ night scheduled for Wednesday, Sept. 12, but because she was supposed to be out of town, her friends moved it up to Monday the 10th. Nearly all of Ms. Fernandez’s friends were there, and her family has a photo of all of them, snapped at 10:45 p.m. Words from Dr. Emiliana Grijalvo – Carmona, younger sister and one of the surviving siblings of Ilonggo mechanical engineer Ramon Grijalvo. Engineer Ramon was among the 2,948 confirmed deaths in the September 1, 2001 terror attack in American soil. Perpetuated by suicide bombers under Muslim extremist Usama Bin Laden, Engineer Ramon’s American dream was cut short ten years ago. As much of the world rejoices in Bin Laden’s death in the hands of American forces, for Dr. Carmona, “actual closure” came way before the master terrorist’s killing. This as she vividly recalls the day it happened and shares with Philippine News Service (PNS) the family’s ordeal thereafter. “I was watching television when the news on the attack was reported…I did not realized then that it was the building where my brother works,” she began. Engineer Ramon first set foot in America in 1963 following the petition to migrate made by their eldest sister, Dr. Gloria Grijalvo Madoramente. The years in between were good to the Grijalvos with Engineer Ramon and wife Nenita Baldago of Banate, Iloilo blessed with two children. What followed thereafter was to be the greatest shock for the Grijalvo clan as Dr. Carmona and her siblings back here in Iloilo City stayed glued on television for any news. “That morning of the attack, my sister in law was telling my brother not to go to work. She asked him to stay home and wait for a delivery. But he said no..he wants to report for work. And we are all early risers, we are all punctual when it comes to work so he was there when it all happened,” she said. Engineer Ramon’s office is on the 9th floor of the north Tower of the World Trade Center. “He’s not my brother, he told them and for days we were at a loss…finally we knew of the mistaken claim and eventually, that body wrongfully buried as a Chinese-American man was exhumed and there we got the confirmation, our brother Ramon was returned to us,” she said. Since then, the Grijalvo siblings took turns in joining thousands of other grieving family members in New York as America remember all those who perished in the September 11, 2001 terror attack. “My first impression when I was first got there in Ground Zero – grabe man sila…nga-a gin-amo gid ni nila (How could they do this? Why did they have to do it this way? )…..it’s complete devastation,” Dr. Carmona shared saying it was an overwhelming sight to be with young mothers, young wives, parents and like them, bereaved siblings. Engineer Ramon’s homecoming to Iloilo happened every 2 to 3 years where they would all stay at the family home in Sta. Cruz, Arevalo, Iloilo City. “We came from a modest family. My brothers Aurelio and Ramon grew up with our uncle-priest, Monsignor Panfilo Brasil. Ramon was closest to Aurelio. He loved Ilonggo songs and Filipino music. One of his favorites was Yoyoy Villame. He was a happy person, loving family man,” Dr. Carmona said of her brother. Engineer Ramon left behind his wife who has since remained unmarried. He has two children, one now successful lady lawyer based in New York. “My sister-in-law after the attack had difficulty moving on. One year after it happened, we visited her and everything was still in place, untouched. My brother’s beer bottle still there on the table where he left it. Even the peanuts he loved to eat, left untouched. His pajamas under his pillow, still there and when we asked her to keep it away, to move on, I remember how my sister-in-law cried and begged us not to do that,” she said. Engineer Ramon was 58 years old when he lost his life that fateful day. He was a Mechanical Engineering graduate of the University of San Agustin here in Iloilo City. He was one of the 12 Grijalvo siblings who hailed from Guimbal, Iloilo. In one of the memorial set for the victims and heroes of 9/11, Ramon’s daughter Rachel honored her father in words spoken from the heart. “Ramon Grijalvo was much more than the title under his name could ever tell you. He was a devoted husband, married 23 years. He was the father of two children, 18 and 16 at the time he was taken away. I’m his daughter. I’m 20 years old now, and no matter how much time has passed, it is still so hard to see his picture here. I wish he was still here with us, but now I only have the wonderful memories he has left me. And yet another message for the world to see posted back in February 8, 2005. Frederick’s contributions ranged from helping to set up for services to giving occasional readings to arranging for members to get there, even when it meant enlisting his children or driving them himself. Profile courtesy of THE NEW YORK TIMES. Arnold Lim, an analyst with Fiduciary Trust Company International, had promised his mother that he would be married by the time he turned 30. He was close to making good on his pledge. He was engaged to be married to his girlfriend of seven years, Michelle Leung, and her family gave an engagement party for the couple two weeks before the attack on the World Trade Center, where Mr. Lim worked. He was 28; the marriage was planned for September this year. Mr. Lim, the youngest of her three sons, lived with her in the apartment in Stuyvesant Town where he was raised. She misses him terribly. Profile published in THE NEW YORK TIMES on May 5, 2002. When Manuel Lopez was not putting in long days as a corporate tax manager for Marsh & McLennan in 1 World Trade Center, he liked to tend the big garden he and his wife had in Jersey City. The backyard plot bore beans, tomatoes, mustard greens ‹ the last an important ingredient in sinigang, a tangy soup of Mr. Lopez’s native Philippines. “A couple days after the World Trade Center, a drill showed up in the mail. It was really weird for us. Profile published in THE NEW YORK TIMES on November 4, 2001. After moving to Jersey City from the Philippines in his mid-20s with his pregnant wife, Manuel Lopez found his passion in creating a comfortable place for his family. In recent months, he organized the remodeling of the family’s duplex, paying close attention to light fixtures and other details. He also filled with house with plenty of electronic gadgets, from DVD players, stereos and cameras to a TV set in each bedroom, his family said. It was on a morning during which Mr. Lopez, 54, known as Manny, exercised that passion for nesting that his life was cut short. Moments after arriving at work on the 98th floor of Tower One of the World Trade Center on Sept. 11, he called his wife, Rosalia, to go over some details of their remodeling project. Ten minutes after he hung up, the first jet struck the World Trade Center. His wife, hearing the news on the radio, tried to call back, but she was not able to get through to him. “He wanted to provide a better life for his future family,” said his daughter, Minnie Rose Morison, also of Jersey City. Mr. Lopez knew hard work would provide a better future for his family, they said. He was vice president of the federal tax department at Marsh & McLennan, his employer for 15 years, and often arrived at work early. On the fateful morning, Mr. Lopez was driven to the PATH station in Jersey City by his son, Mannie Jay Lopez, who had returned home from an overnight work shift before heading out to a class at New Jersey City University. “He always had a joke to tell,” his son said. Mr. Lopez was fond of electronic gadgets, and was an avid reader of Stereo Review and other magazines to keep up with trends in electronics. In addition to a new TV in each of three bedrooms, Mr. Lopez kept a classic TV in the kitchen, a Sony from the 1980s, for “sentimental” reasons, his son said. “He joked a lot and he loved to go shopping,” his wife added. It was the example of hard work, done with a sense of humor, that his son remembered. “He wanted to show me a better life,” his son said. Mr. Lopez’s remains were not positively identified until more than two months after the tragedy, on Nov. 16. Officials made the identification using DNA tests, his daughter said. In addition to his wife, daughter and son, Mr. Lopez also is survived by two sisters, Jovita “Betty” Lozano of New York and Avelina Cabal; and two brothers, Geronimo Montero and Benjamin Montero, all of the Philippines; and other relatives. A graveside service will be held at 10 a.m. today in Arlington Cemetery, Kearny. 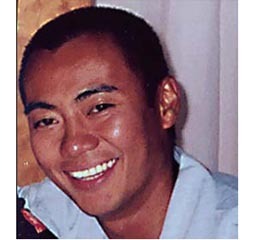 The New York City’s Office of the Medical Examiner has positively identified Filipino-American Carl Allen Peralta of Staten Island, N.Y., as among those who died in the Sept. 11 attack on the World Trade Center, the Filipino Reporter has learned. Peralta, 37, a broker with Cantor Fitzgerald on the 104th floor of WTC One, was identified following the standard comparison of nuclear or mitochondrial DNA from remains with samples provided by relatives. The medical examiner did not specify what Peralta’s body part was recovered from the rubble that killed more than 2,800 people. Profile by George Berkin published in THE STAR-LEDGER. Maria Theresa Santillan, known to her family as Maritess, was the meticulous, well-organized type. A customer service representative with eSpeed, the Cantor Fitzgerald subsidiary, she had been busy since last November planning a wedding scheduled for next May. Ms. Santillan, who had two younger brothers and still lived in the family home in Morris Plains, N.J., planned to invite 250 people to celebrate her wedding to Darren Sasso, a civil engineer who had been her boyfriend since high school. The wedding was to have taken place at the Cathedral Basilica of the Sacred Heart in Newark. Ms. Santillan had wanted to release doves after her wedding to symbolize love and peace. After her memorial service, six doves were released into the sky. Maria Theresa Santillan and Judy Hazel Fernandez had always been close so the 27-year-old first cousins welcomed the chance to work together at the World Trade Center. Miss Fernandez got a job at Cantor Fitzgerald about three years ago, and when a job opened up at the company’s eSpeed subsidiary, the first person she thought of was her cousin. Working with her cousin made the dream even better. “They were closer than cousins,” recalled Ms. Santillan’s father, Ex. Some people even thought they looked like sisters. Both majored in biology and were Rutgers University graduates. Miss Santillan attended the Newark campus; Miss Fernandez, New Brunswick. Also very close to her family, Miss Santillan lived with her parents in Morris Plains. Her father dropped her at the PATH station a few times a week — Sept. 11 was one of those days. “We carpooled that morning together,” said Ex Santillan, who is the brother of Ms. Fernandez’s mother. She worked in the North Tower on the 103rd floor, her cousin on the floor above. He didn’t hear from her again. Just two months earlier, the families celebrated Miss Santillan’s engagement. Everyone was looking forward to the May wedding. Miss Fernandez was to be maid of honor. “She was very smart, very intelligent, very loving, very witty — everything you can think of,” Miss Fernandez’s mother, Corazon, said of her daughter who lived in Jersey City but was a frequent visitor to her parents’ Parlin house. “Whenever she came home, she said, ‘Mom, I’m here,’ and kissed me and asked for her dog (an American Eskimo named Brook).” Miss Fernandez could not have pets in her apartment. The weekend before the tragedy, Mrs. Fernandez told her mother she was going on a business trip on Sept. 11. In a Sept. 10 phone call, Miss Fernandez mentioned she would go to work before leaving. She told her mom a limousine would pick her up at the Trade Center. Rich Fernandez of Pennsylvania, Miss Fernandez’s brother, said his sister had talked about a future with her boyfriend, Jon Plamenco. “The four (the cousins and their boyfriends) spent a lot of time together — they were inseparable,” Rich Fernandez said. Ex Santillan also recalled the engagement party. A memorial service for the cousins will be held at 10 a.m. Nov. 3 at Cathedral Basilica of the Sacred Heart, 89 Ridge St., Newark. In lieu of flowers, the families ask that contributions be made to a scholarship fund that still is being planned. Miss Fernandez also is survived by her father, Cirilo Corazon; and her sister, Emma of Philadelphia. Miss Santillan also is survived by her mother, Ester; and brother, Raymond, both of Morris Plains. Profile by Lisa Irizarry published in THE STAR-LEDGER. Roy Santos was a perpetual tourist in the city that he loved. He had lived in New York for nearly six years, but still relished it. His mother, Aurora, called him “a Broadway addict.” He had to get tickets to all the latest shows, loved “The Producers,” loved “The Lion King.” On the memorial Web page Mr. Santos’s friends created, there are photographs of him against the New York skyline, the Statue of Liberty, the World Trade Center. Last Christmas, his brother Ronald and Ronald’s wife, Rosemary, stayed with him on the Upper East Side. It was a typical Roy good time. They saw “Cabaret,” had Christmas brunch at the Marriott Hotel’s revolving restaurant, and spent the rest of the day in Central Park, playing in the snow. On New Year’s Eve they were supposed to go to Times Square, but Roy Santos got the flu. It was the second year in a row that he had gotten sick and missed it. “Next year, I’ll be ready,” he told his brother. On Sept. 11, Mr. Santos, 37, was at the trade center again. This time, Mr. Santos, a computer consultant for Accenture, was working. It’s frustrating Every year when the anniversary of 9/11/01 comes, we see the horrifying images and sit through the documentaries about that day. Some of us watch them, unable to look away, even though doing so brings back memories and emotional scars that may only be starting to heal from the previous year. I always think of Marc as an obedient and hard-working son. He was a gifted musican who can play the piano by ear with my favorite song “right here waiting” by Richard Marx. He would do his chores around the house without complaining. He would make us laugh with his good sense of humor especially everytime he impersonate actor Jim Carrey.I can still remember how happy he was when I bought him his first car and I named it “yellow boat” coz the color was yellow. We travelled to his homeland (Philippines) together. Although I am not his biological mother, Marc recognized me as his own mother and never fail to call me on mother’s day and my birthday (June 12). His birthday is a day after mine, June 13. Now, I missed those calls. I found his biological father in Sioux Falls, SD and also his biological mother in the Philippines. Although it was a bittersweet reunion, he was happy to finally met both of them. I can never forget his face when he hug me and thank me for finding his biological parents and sister because he knew that I worked so hard in finding them because at that time adoption papers were sealed in Washington, DC. I always think of Marc and still cry everytime I look at his picture. I will always miss him and will never forget and cherished our conversations together (the promises he made to me, his goals, and the happy times we share together as a family. Larry Sumaya’s friends and family had a lot of names for him. Like Phil, short for Filipino, his ethnicity. Or Horatio, because Hilario was the first name on his birth certificate. Or Gooch and Clem, for reasons no one can quite recall. But the good-natured Mr. Sumaya, 42, took the kidding in stride, always ready to tackle the steep fast curves of the mountain, the rolling greens of the golf course, the waves of the Jersey Shore, the social currents of big-city bachelor life. “He was always smiling, very outgoing,” said his sister Charito LeBlanc. Mrs. LeBlanc and her husband, Joseph, miss him the most on Sundays, because that was the day Mr. Sumaya would spend time at their home near his in Staten Island, watching sports, smoking a cigar in the backyard, firing up the barbecue. Mr. Sumaya, a technology manager at Marsh & McLennan, liked to talk politics and knew how to press home a point. “He was tough to argue with,” said another friend, Tom Todaro. But he was also slow to anger, and played the ambassador in his ski club, putting newcomers at ease. At home in Holliswood, Queens, he had a karaoke machine with thousands of songs. “He had a lot of friends, most of them are relatives, and on Friday nights and Saturday nights and sometimes weeknights they would drink together and sing together,” said his sister-in-law, Sylvia Mercene. Many of those relatives lived with Mr. Tamayo at some point, because he opened his house to family and friends when they came to the United States from Aklan province in the Philippines, as he had in 1980. “As a joke we call his house the Ellis Island,” Ms. Mercene said. Five of his six siblings are now in the United States, as are his wife, Evelyn, and their two children, Ian, 20, and Pamela, 16. Ms. Motus-Wilson, 52 and the head receptionist at International Office Centers Corporation in the World Trade Center, was proud of the culture of her native Philippines but had recently become an American citizen. She was an accomplished craftswoman, creating everything from delicate flower arrangements to wall hangings. She was about to move with her husband into her first house, where she would have a studio, in Warwick, N.Y.